Bleeker, P. 1854 - Natuurkundig Tijdschrift voor Nederlandsch Indië 7: 49-108. Overzigt der ichthyologische fauna van Sumatra, met beschrijving van eenige nieuwe soorten. Tang, Q., H. Liu, R. Mayden and B. Xiong. 2006 - Mol. Phylogenet. Evol. 39(2): 347-357. Šlechtová, V., J. Bohlen and H. H. Tan. 2007 - Mol. Phylogenet. Evol. 44(3): 1358-1365. Alfred, E. R. 1961 - Bulletin of the Raffles Museum 30: 32-37. 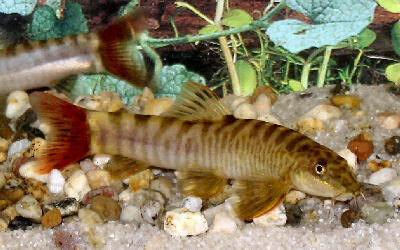 Notes on a re-examination of some Bleeker type specimens of Indo-Malayan fresh-water fishes. Part 1, Cobitidae and Homalopteridae. Champasri, T. 2003 - Pakistan Journal of Biological Sciences 6(1): 65-69. Some Ecological Aspects, Water Properties and Natural Fish Species of the Phrom River in Northeast Thailand. Šlechtová, V., J. Bohlen and A. Perdices. 2008 - Mol. Phylogenet. Evol. 47(2): 812-831. تغذیه:غذای کف ابی مانند بیومار_لارو حشرات و میگوی اب شیرین فریز شده. همزیستی:با سایر اعضای خانواده مشکلی ندارد. تولید مثل:در اسارت غیر ممکن است.